Bullet-lined shoes discovered at an airport checkpoint. Photo by TSA. 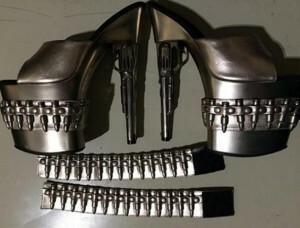 A woman trying to board a flight was stopped when security found bullet-lined platform shoes with revolvers for heels. The incident happened at Baltimore-Washington International Airport on Monday, when an unidentified passenger was stopped by the TSA for having the shoes and a bracelet lined with bullets, Time reports. “Shoes and bracelets that are less than ideal to wear or bring to a @TSA checkpoint. These delayed a traveler at BWI,” the agency’s spokeswoman Lisa Farbstein posted on Twitter Monday. The platform shoes were in the traveler’s carry-on bag. Instead of abandoning her flight, the woman abandoned the shoe and bracelet. In 2015, the TSA found an average of seven firearms a day at airport checkpoints. Posted: 3/1/16 at 10:03 AM under News Story.